Abstract: In the last few years there has been an increasing tendency of studies which have been paying attention to issues related to health. 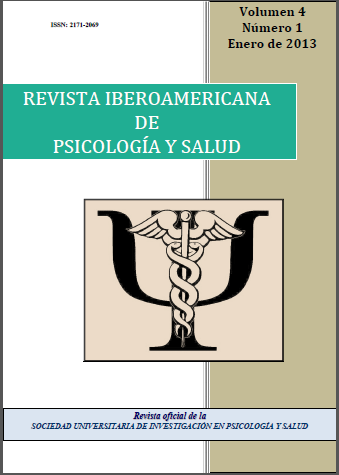 This work is aimed to the study of the characteristics of the publications of health education which have been released in Spain for the last 20 years. Different scientific data have been consulted, analysing in each work the type of intervention, the topic dealt with, the methodology and their suitability to the criteria established by the World Health Organization (WHO) The results state: a) from the 245 articles studied, only four of them fulfilled the criteria established by The WHO for the educative institutions which promote health; b) The interventions are mainly focused on prevention rather than on health promotion, and c) the university institutions have a more prominent role than the no university ones to spread health promotion. Keywords: education; health; promotion; bibliometric study; intervention. Abstract: The present study analyses the psychometric properties of the Body Image Anxiety Scale (BIAS) on students of Social Sciences. The total sample comprised 589 participants; 376 women and 213 men, all of them freshman at Universidad Autónoma de Chihuahua in the area of social sciences, with a mean age of 18.24 years (DS = 0.73). Psychometric analysis showed that a two-factorial structure was viable and adequate. The factor structure of the questionnaire was analyzed with confirmatory factor analysis (CFA). The structure of the two factors, attending to substantive and statistic criteria, showed adequate indicators of adjustment of reliability and validity. In addition, factor analysis conducted with subsamples indicated the presence of strong evidence of factor structure stability. Future research should replicate these findings in larger samples. Keywords: instrument construction; factor structure; measurement invariance; instrumental study; construct validation; structural equation. Abstract: This work analyses the scientific research worldwide on the therapeutic use of cannabinoids in various diseases, as well as the application of nanotechnology to the development of novel delivery systems for these drugs. For this purpose, three databases commonly used in the Health Science field; PubMed, Scopus and Web of Science (WoS), are studied comparatively. Results clearly show a growing interest on these molecules and their numerous therapeutic applications. The output from the three databases on the item cannabinoids is compared as well as its association with the item therapeutic. As it can be seen, Scopus and WoS show similar trends, despite the number of documents indexed in Scopus for the period 2007-2012 being lower than in the case of WoS. Nevertheless, PubMed shows a completely differing trend. Regarding the application of nanotechnology to the development of novel delivery systems for these drugs in the form of nano- and micro- spheres and particles, substantial differences are found. Scopus does not differentiate between the results for the items nanotechnology and microspheres, while Scopus and WoS provide the higher number of results for the association of nanoparticles + cannabinoids, with a total number of 10 research papers, 40% of which are Spanish. Keywords: cannabinoids; therapeutic interest; nanotechnology; nanoparticles; development.